In every poem, Clark finds Panepinto’s words to be moving and knowing. While sadness runs through Panepinto’s poems, joy and reflection surface in her conversations with crows and in her memories of people who have died. 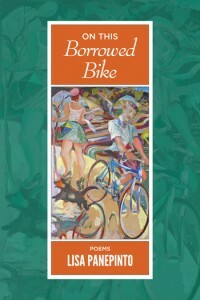 The title poem, a surreal ride on a dead teenager’s bicycle, carries her into a world filled with life. Even a simple bus ride transports the reader on a wave of words. For more on Panepinto’s books, including links to purchase options, click here.